Don't want to move, but need an extra bedroom? Starting to work from home? DJT Building and Landscaping Contractors have built extensions in many styles and can always find a simple, elegant solution to your need for more space. We also carry out a wide range of conversions including loft and garage conversion that can free up even more unused space in your home. DJT Building and Landscaping Contractors operate a personal service where you can always speak to same person. We are also very careful about how much work we can take on as we would rather complete projects to a high standard and not take on too much. Neither will we ever pass your work on to another builder; we maintain contact with all projects as we know that this is the only way to ensure our high standards are consistently met. 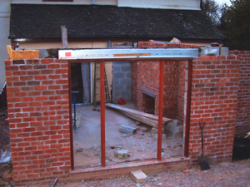 If you are looking for a team to handle building your property extension in the Market Drayton area then give us a call on 01630 647801. We understand the requirements of creating the right home in your property and making it work for you and your family. We look forward to speaking with you and working out solutions to create more space in your home.